The Economics faculty and staff invite graduates and their guests to attend the department’s graduation ceremony and reception on June 17, 2019 at 12:30 PM. Be sure to complete the department’s undergraduate commencement registration form if you plan to walk in the ceremony (register by June 5), in addition to applying for your degree on DuckWeb. Please review your Graduation Checklist. All Doctoral and Masters graduates should contact the main office. This ceremony is for both economics undergraduate and graduate students. Graduating students will be individually recognized. The ceremony will be approximately one and a half hours long. Our department event is an outdoor ceremony where shade or covering may not be readily available; please plan accordingly. The ceremony will be held rain or shine. Tickets are not required or available for our departmental ceremony. 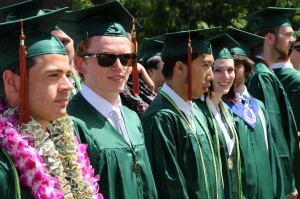 More information about our location can be found on the UO Commencement website. Parking on campus is very limited. The University will provide free shuttle buses from Autzen Stadium to the main campus. It is strongly suggested that commencement guests park at Autzen Stadium and ride the shuttle bus. Parking and shuttle information is available on the UO commencement website. Graduates must arrive at least 30 minutes before the ceremony starts. Pick up your name card at the check-in table, which is located behind the seating (balloons will be by the table). Once the name card is picked up, students will start forming two separate lines. Look for signage and commencement staff to direct you. The lines are not in alphabetical order. To ensure you are sitting with your walking buddy, they must be in front of or behind you in that same line as our graduates make their entrance into the ceremony in three lines, to fill three separate sections. Ushers will direct each row of graduates when to rise and proceed to the stage. When you get on to the stage, hand your name card to the faculty member at the podium to be read. Walk across the stage to the department head (Bruce McGough) who will present your diploma cover to you. Take the cover with your left hand and shake hands with your right hand. A photographer will take your picture a few feet away from the base of the stairs once you get off the stage. Please proceed through this area in an orderly manner. After departing the stage and the photo area, please return to your seat and follow the ushers as they will be guiding you back to your row. At the closing of the ceremony, you will be instructed to “flip the tassel” to the left side of your cap. Be sure to get some photographs taken with your friends or with influential faculty members before you leave! We encourage graduates and their guests to also attend the University Graduation Celebration beginning with an academic parade to the Matthew Knight Arena at 8:45 a.m. and the main ceremony starting at 9:30 a.m. Details regarding the main university ceremony can be found here. Regalia (cap, gown, and tassel) is required and can be ordered from the University of Oregon Duck Store beginning March 26, 2019. The Duck Store will be hosting a Grad Fair April 8-11, 2019 to assist students with regalia selection. Graduation announcements can be ordered from the Duck Store. Grad Images will photograph all graduates at the ceremony and in various locations across campus. Be sure to complete our Exit and Employment Survey to let us know what you have planned after commencement!